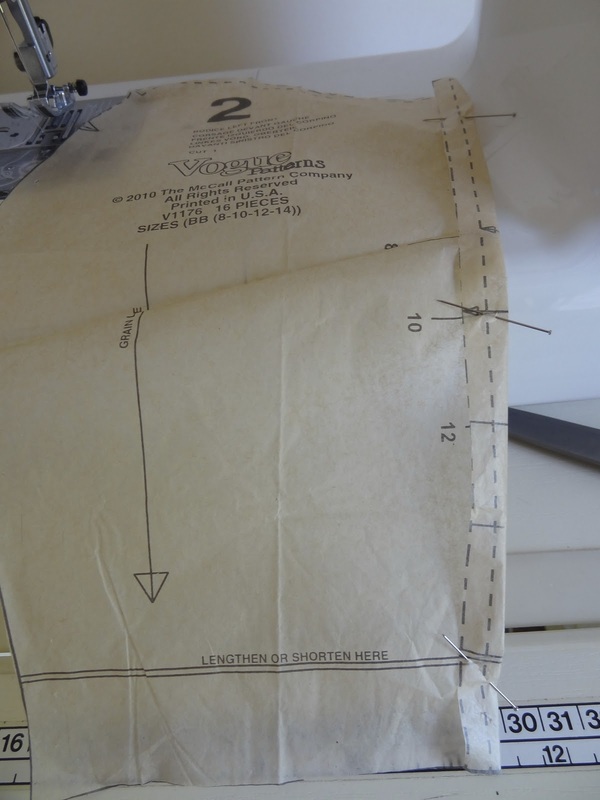 I've had the vogue pattern V1176 by designer Michael Kors in my stash for some time and it seemed to always eye me down every time I walked into my sewing room. I'm pretty sure my pattern collection comes to life when they think no one's around. (Or maybe my excessive coffee drinking has finally taken a toll on my sanity.) This pattern design has such a sweet look that it gives me a tooth ache just thinking about it! What's not to love about this pattern! It has a vintage look with a very Mad Men feel to it, and let's be honest I'm a sucker for a pretty bow. It wasn't until I bought this fabulous pink cotton/lame blend fabric while on honeymoon in Hawaii (yes sewers my poor darling husband had to wait around for me in a fabric store on our romantic get away) that things starting cooking in my mind. Why not over indulge the sweetness of this pattern and make it pink! (and shiny!!) And so it began. I have to admit, I love it! There's something incredibly fun about wearing a dress that is incredibly girly. I just couldn't help but give my hips a little extra swing when wearing this dress around town and amping it up with red lipstick! I've seen this dress in both dark colours and prints and they all look fabulous. But what I love about this light cotton candy coloured fabric is that it really brings out the subtle detail in the pleats across the bust and the pretty bow. If you look at the model on the front of the pattern cover, it's pretty hard to see those gorgeous details that Mr. Kors has spent time creating! Now because the combination of pink, bows and shiny fabric are clearly not sickly sweet enough *cough* I decided to add one more touch and add some gorgeous white lace trim to the bow and skirt. 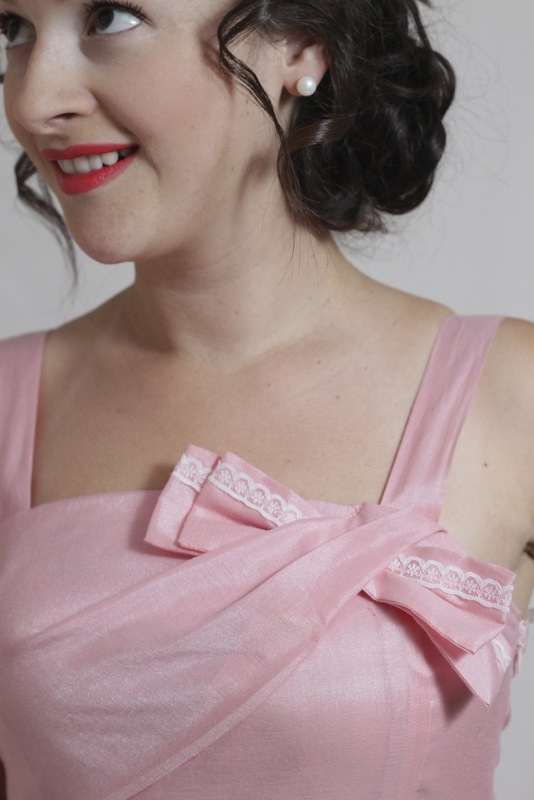 I think this little detail on the bow and the hem gives the dress just that extra little something to steer it away from the boring category which straight colour fabrics can sometimes run the risk of falling into. 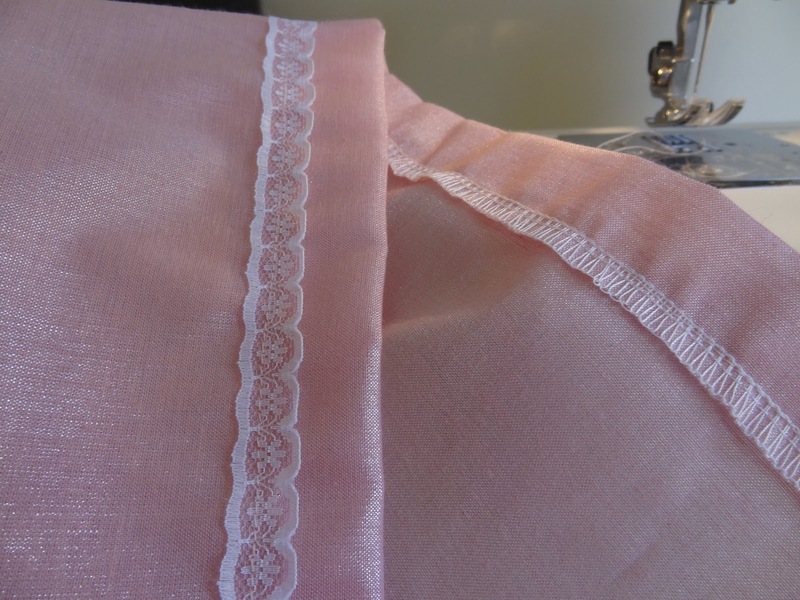 You know the great thing about adding the lace trim just above the edge of the hem is ... you don't have to hand stitch a blind hem! That's right, you can CHEAT! And I'm all about cheating, as long as it doesn't compromise the quality of the garment. 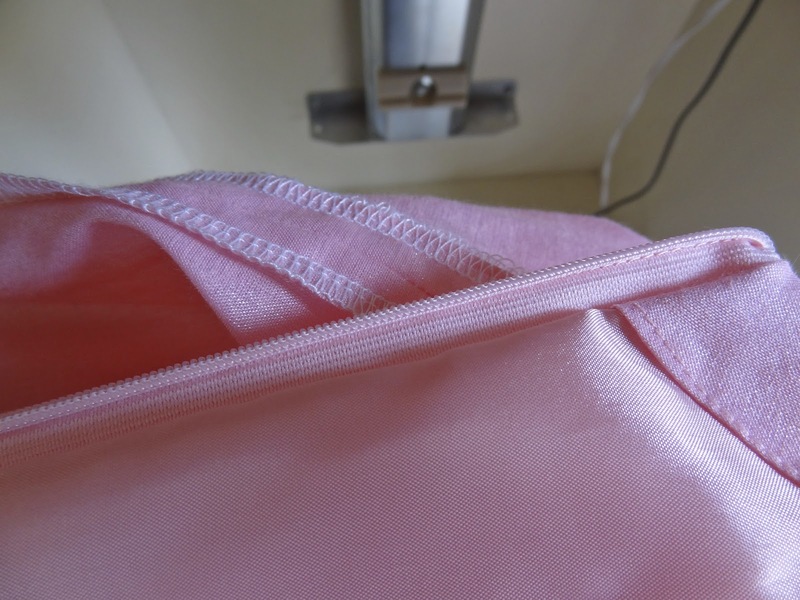 I overlocked (serged) the raw edge of my skirt and then ironed my hem into place. 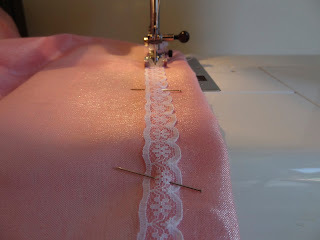 On the good side of the fabric, I felt around for my overlocked edge and pinned the lace trip directly above it. 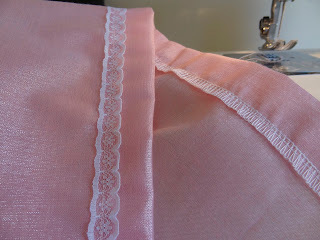 I then sewed straight down the centre of lace trim, which also secured the hem into place! 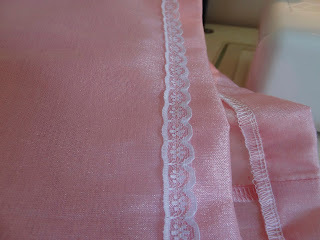 I matched my thread with the pink fabric which blended easily so that you can barely see the stitching line. And because I sewed through the centre of the lace, and thus the centre of the serged edge, the stitching line is barely visible on the inside of the skirt as well! Love it! I also added the lace trim to the inside hem of the skirt lining, cause as people have always told us from birth, it's what's on the inside that counts. Though us sewers know it's both! 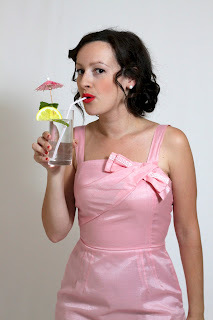 I read a few reviews of this dress on other blogs and on Pattern Review and every one said the same thing; the sizing on the bodice was all over the shop. The bodice was crazy big, or rather the front bodice pieces were too wide - more on that in a sec. As for the skirt proportions, I must confessed I used my own skirt pattern because when a girl with ample hips finds a pattern that works for her lower half, it's a good idea to stick with it. If you are going to attempt this pattern and you don't want to be disappointed with the results, make yourself a muslin first, you won't be sorry! After reading many other warnings about the bodice sizing I decided to make my muslin a size smaller than I normally do, so I cut out a size ten. I'm normally about a 12 in the bodice and a 10 on the waist. 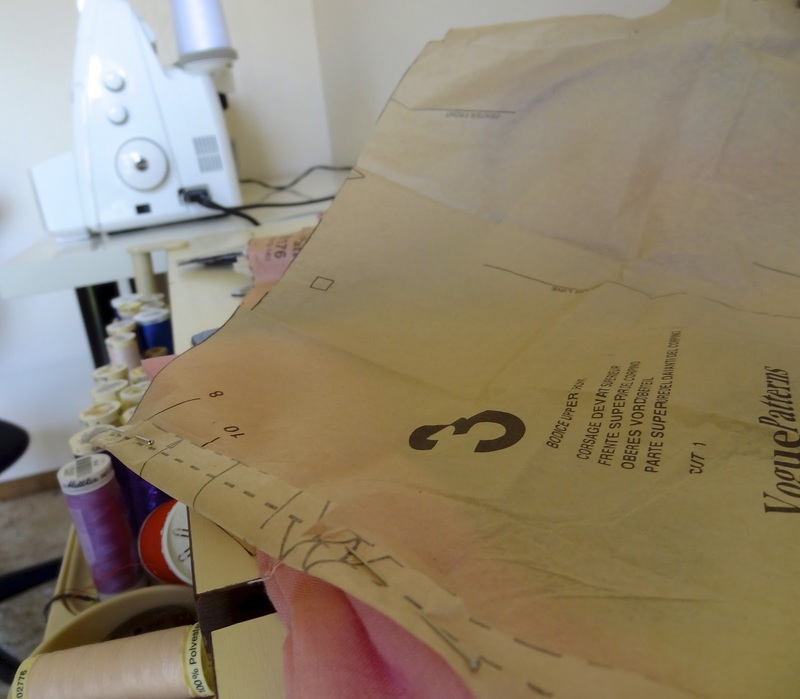 After creating the muslin for the bodice I lay the width of the waist on to the waist of my fall-back skirt pattern, which has a waist of about size 10 and scratched my head. What I noticed is that from the side seams to the centre back, the skirt and the bodice matched, but it was the front bodice that was flapping around like a fish! Ah-ha! I ended up reducing the side seam on bodice piece 1, 2 and 3 by four cm's in total; that's two cm's off on both sides of the bodice front, with no changes needed to be made on the bodice back sections! 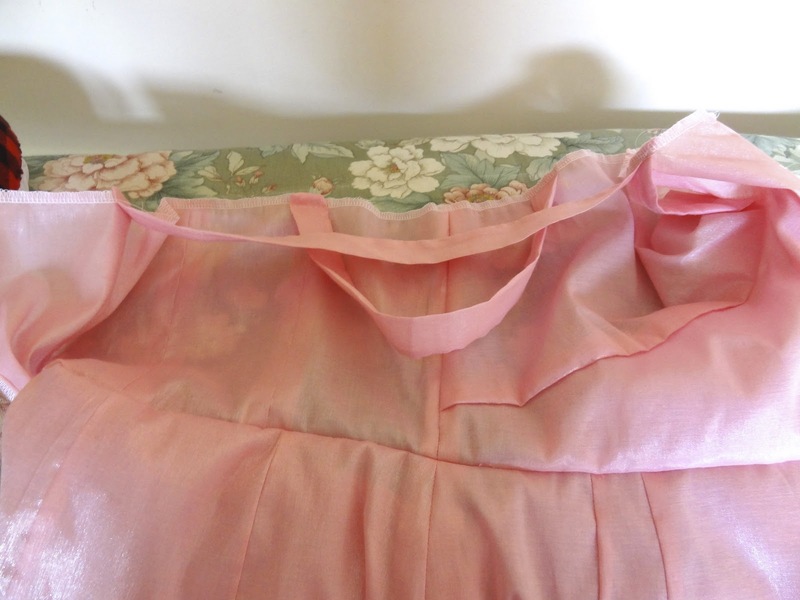 Finally the side and centre back seams of the bodice and skirt matched. Yay! The other alteration I made was the length of the shoulder straps and the process of attaching them to the back of the skirt. Firstly, I'm a short bodiced gal, so I'm pretty much always shortening the bodice by my average three cm's. This time instead I just shortened the straps by three cm's instead of the bodice which made it a lot easier. The high neckline of the dress meant that nothing started gaping. The change I made to the construction of the straps was to machine sew the back of the shoulder straps in place before adding the lining. The pattern instructions would have you stitch them down after you've attached the lining making the bottoms of the straps visible on the inside! This just won't do! 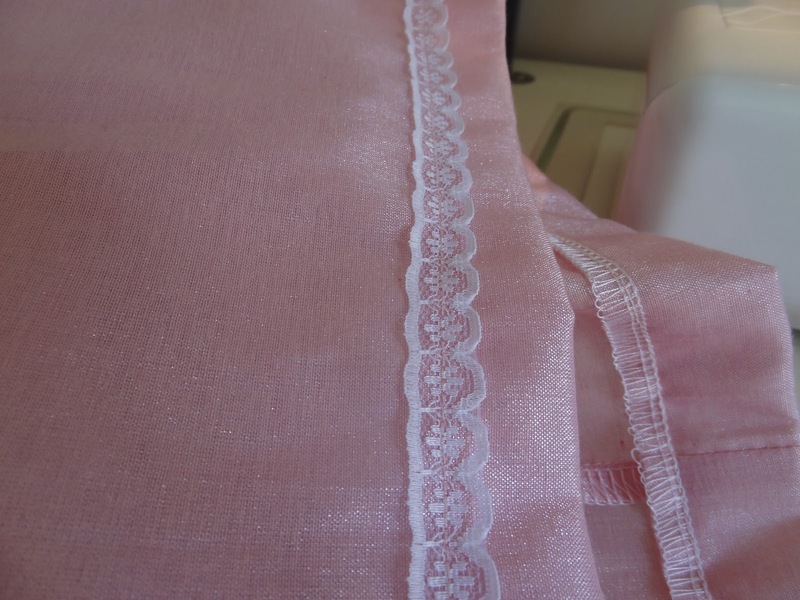 I suppose they've dont it this way so you have more flexibility in unpicking the straps and adjusting the length if you're not happy with the length, but I think if you make a good muslin first, you should be able to work out the appropriate length from the muslin. 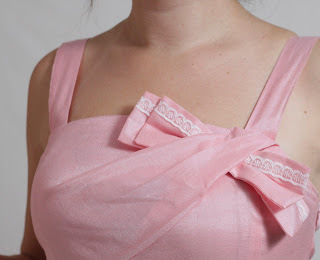 So, before I attached the lining to the dress at the neckline, I machine sewed the straps securely into place. The length of the strap is not as long as the length of the whole neckline, so you can see the fabric curl up on the sides when it lays flat. It just means pinning and sewing the lining onto the front and back neck feels a little bit more 3D but the cleaner end result with the bottoms of the straps tucked in is worth it. Apart from the fitting issues of the bodice, and my slight construction variation, this pattern was quite a pleasure to make! The instructions were refreshing very clear and well explained and the order of construction flowed instinctively. I also love how the dress is fully lined and with a side invisible zip to give the dress an extra couture touch. I had every intention of making a belt to go with the dress, as the pattern does include instructions, but after adding the lace trim I didn't think it really needed it. Almost forgot; here's a few back views of the dress! In conclusion, I love this simple but sweet design and how well (I hope!) 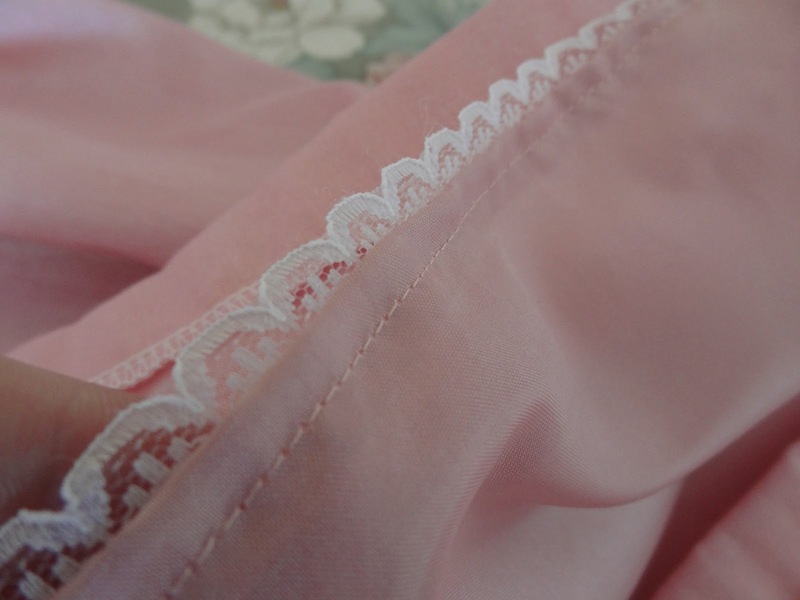 it mixed with the pink shiny fabric and the lace. 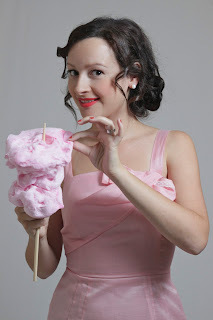 The colour reminds me of Cotton Candy, or Fairy Floss as we call it here in Australia, and so I couldn't resist using cotton candy in the photos! A big thank you to my very patient and talented husband who let me employ his time and skills for these photos that you see. This dress is already one of my favourite dresses, and it's timeless-ness will make it appropriate for years to come. If you've been thinking about giving this pattern a try, do it! ... and yes your suspicions are correct, there is no longer any cotton candy left in the house ... it may or may not have been all eaten ... by myself. Pretty is probably the understatement of the year ... lovely work!!! 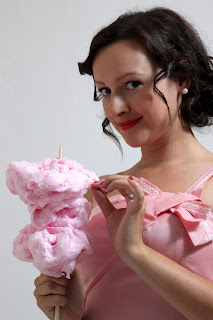 And I've never been able to eat Fairy Floss ever - but it does match the dress beautifully! @HandmadeThank you very much! Rest assured, I greatly regretted eating it about five minutes after my last bite! Looks wonderful! I have this pattern in my stash too, along with some potential fabric. Hopefully I'll get to it soon. WHat a beautiful dress , I love it . Thankyou for the very helpful review . Stunning dress! You did a great job and you look fantastic. Gosh, adorable! It's stunning, I love the lace detailing. Great job, as usual! This is just gorgeous, and so very flattering! I love the detail of the bow and the way your red-lipstick makes it more va-va-voom then little-girl-lost. Really beautifully made, I always love your confections! @littlebettyThank you littlebetty! Definitely give it a go. I think with this dress if you go in there pre-prepared to have fitting issues it takes the shock away and you get a good result. @Lisa Thanks Lisa I am very happy with how it turned out, and I'm so glad I read the other reviews before tackling the bodice. This dress is going to get a work out! @Karin Karin you are too kind! @strugglesewsastraightseam Thank you! I am partial to a bit of red-lipstick. It always makes me feel like I'm playing dress ups. Love it! 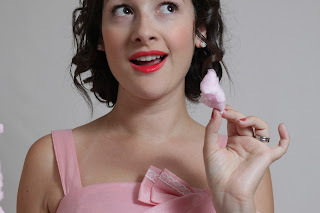 Gorgeous dress on you and the colour is so 'sweet'!! Love the personal touches to this dress - great job!! @Evelyne thanks Evelyne! 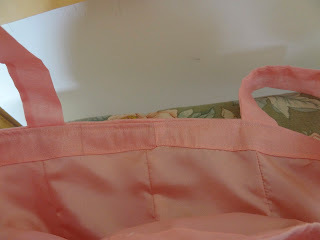 I've overlooked pink fabrics in the past thinking they would be too much. Now I want to make more pink dresses!